On this page is a collection of case studies on specific conditions that our practitioners have written themselves. The purpose is to give you an understanding of the types of conditions we routinely treat, the complexity of health disorders that people endure, a view of the assessment and management of cases, and an insight of the clinical rationale and decision making we perform. While each case is realistic, they are completely fictional and are not a testimonial or a write up of any particular person. We feel that these cases will assist you in searching for clues in your own health and whether we may be able to assist you. Once you read the cases, you can see they are the starting point for a conversation or consultation with us. Obviously, these stories are not a substitute for advice or individual diagnosis. Your own health and situation will be unique and any management and treatment will be tailored for you. Kevin is a 38-year-old male who has taken up running over the last 12 months (3 times per week, 5-10km per run) to improve his health. He ran competitively in his teens (middle distance) but has run consistently since his mid-20’s. He reports pain in both shins (more so in the right leg) on and off when running but his pain has got worse in the past month and he has had to stop running. Kevin reports his pain starts about 15 minutes into his run. He admits he doesn’t really “warm up” rather just gets into it as soon as he laces his shoes up! He has already tried switching shoes and adding gel inserts to cushion his feet. He also saw a physiotherapist 3 weeks ago who tried ultrasound therapy as well as some massage and stretching. Nothing reduced his pain, even when he reduced his running distance under advice of the physio. His general foot position and mechanics were good. His feet were slightly “rolled in” and arch height slightly lower than normal. There was good range of motion (ROM) in the flexibility of the joints in the middle of his foot that would indicate he probably rolls in (or pronates) too much when walking or running. When this happened, the main bone in his lower legs, the tibia or shinbone, internally rotated. Because his foot now pushes the entire load along the inside of his foot, when he does lift his heel off the ground, the main joint of the big toe is locked so he cannot push off properly. The pain that Kevin is experiencing is tendonitis of the tibialis anterior muscle. This muscle runs down the front of the tibia or shin and attaches onto the bones on the inside of the foot, just at the top of the arch. Its job is to slow down the rate at which the foot rolls in or pronates (which is a normal shock absorbing action). In Kevin’s case, however, he is pronating too much too quickly and this muscle is being overworked. The other part of this motion is that the internal rotation of the tibia could actually be “twisting” the bone (yes bone’s have a little bit of flexibility), this torsional force can cause some inflammation of the bone itself can actually lead to a stress fracture. At this time, we can assume that Kevin doesn’t have a stress fracture as he is not in pain all of the time, only after 15 minutes of running. This means we can shelve any plans for an expensive and time-consuming bone scans at this time. Treatment for tibialis anterior tendonitis will involve use of an orthotic in his running shoe to improve the posit ion or posture of his foot and slow that rate of pronation, thus reducing the work load on the sore muscle. Whilst a good quality pre-fabricated orthotic would help, we have recommended we go with a custom fitted orthotic in Kevin’s case. Firstly, it allows us to customise the prescription to suitthe needs of his left and right foot as individual structures, remember, Kevin experiences more pain his right leg, so it makes sense that the needs change from left to right. Secondly, the increased pressures that come with running on hard surfaces need to be considered in the design. With custom orthotics, we have great freedom in materials, both their strength and thickness. Modern manufacturing techniques can produce a product which is stronger, lighter and of a much lower profile in shoes than previous orthotic design. A 3D scan of his feet will ensure a perfect fit and the end result is something that will last 3-4 years as opposed to something that may be replaced after 12 months. This would be combined with massage and stretching of ALL the muscles in the lower leg and foot as everything has been overworking while this problem has been going on, obviously paying close attention to the tibialis anterior muscle during such treatments. Kevin will be able to resume running very soon after commencing the massage and stretching treatments. With reduced distance and speed initially, he will be able to build back up to his normal pace within a few weeks. While waiting for his orthotics to be manufactured (up to 2 weeks), his feet can be stabilised and supported with sports tape and long term, a strengthening program or even adjustment to his running style using further video analysis gives him the ability to increase his running to a higher level if he chooses. Tricia is a 49-year-old woman who works in an administration role that requires her to stand most of the day. Tricia’s first experience with lower back and leg pain was 12 years ago with the birth of her second child. Unfortunately her back and legs have troubled her ever since. Tricia described her problems at length. During the birth she had an epidural injection and the birth itself generated tremendous low back pain. Tricia described pain at the base of her lower back that was intense in her left hip and spread to the outer font of the left thigh and into the calf. While the hip pain is strong and persistent, the symptoms were more of an ache in the lower limb. These days Tricia says that her ‘hips annoy’ and make her feel more irritable and makes her feel ‘down’ and always weak on the left side, so much so that she ‘hobbles in the morning’ with left foot pain. While she is able to ‘keep up with’ her job, her back and lower limb condition drains her of the energy she wishes she could have to look after her family. Obviously Tricia has sought help for her problems by consulting her GP, a podiatrist and a naturopath. Her GP arranged for corticosteroid injections, the first one to the base of the lower back and a second one six months later to the iliotibial band (outer upper left thigh). In addition, the GP prescribed Ceramal (an antidepressant). Between the discussions of her GP regarding the results of her x-rays and CT scans, and her own reading, Tricia understands that her problem is a result of a degenerated lumbar disc and degeneration in her left hip. She states her problem is sciatica and a bad hip. What was clear in the story that Tricia told was that in addition to the length of time and the extent that she has suffered, she is very frustrated and her condition has a significant impact on the quality of life. A brief analysis of Tricia’s gait was not particularly remarkable. 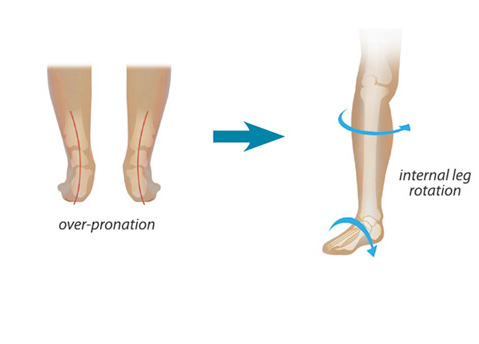 A small degree of increased foot pronation occurs and a small amount of pelvis sway was also noted. The most obvious finding was how stiff her upper body is held when she walks. When examining Tricia’s posture some deficits were readily identified. Tricia’s pelvis is lower on the left and rotated to that side. She has flat feet and a little knock-kneed which is more pronounced on the left. Tricia’s left shoulder is also lower, she has a sway back (increased lumbar lordosis) and is rounded in the mid back (increased thoracic kyphosis). Unfortunately Tricia looks quite unfit; her Body Mass Index (BMI) is 34 so she is obese and looks that way with most of her weight gain in her hips and thighs in a classic pear shape. In fact, the lack of proper muscle tone is visible in her gluteal, feet and thigh muscles. Looking at Tricia’s range of motion, she appears to be quite mobile by background but when she performs a multisegmental rotation (see diagram 1. on next page), a loss of range is observed in the pelvis especially on rotation to the right. A lesser degree of restriction is noted in the thoracic rotation. Tricia’s forward bending to touch her toes is nearly full but the extension of her thoracic spine was moderately limited. A single leg stance test was used to give insight to how well Tricia could balance on her feet: with her eyes open she was within normal range of 25 seconds on each foot but with her eyes closed, she was unable to balance for more than 3 or 4 seconds. At the same time, her pelvis would deviate more to each side than normal and more pronounced on the left. A single leg squat showed stability was compromised, as each knee would deviate towards the midline and again this was more noticeable on the left. Once sitting, evaluation of hip rotation was performed and external rotation was limited to 27 degrees on the left 30 on the right and internal rotation was limited to 20 degrees on the left and 32 right (see diagram 2.). 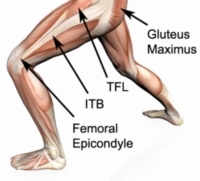 Observing hip flexion while seated showed excessive trunk movement especially on the left. A seated Slump test was conducted and this did not show any symptoms or limitations. Deep tendon reflexes were active, equal and normal. While supine, orthopaedic tests of the hips were carried out without any significant findings. Abduction of both hips was moderately limited by muscle tightness and again this was more obvious on the left. Similarly, assessment of the length of other muscles was performed and the left iliotibial band on the outside of the thigh was noticeably tighter and shorter than normal. All these findings were discussed with Tricia. She was surprised that we did not believe she suffers from sciatica at all nor does she have a lumbar disc problem. To add to the contradiction, we disagreed that Tricia suffers from a primary hip disorder. We felt that there were a number of dysfunctions in her pelvis though. We suggested that her left sacroiliac joint was a key dysfunctional factor that we could assist via chiropractic adjustments. The plan from our point of view was to build greater confidence and independence in Tricia’s health and wellbeing by re-framing and educating her about what we felt to be ill-fitting previous diagnoses and the over emphasis on structural pathology. It appeared to us that she had previously had a lack of reassurance of her concerns on the perceived degeneration and pathology. An area that was flagged for later investigation was to consider a hormonal influence in her condition and strategies to manage this in collaboration with her GP or other health care providers. Tricia was treated with a series of chiropractic adjustments to her sacroiliac joint and thoracic spine, mobilisation and stretching of her hip; PNF style stretching of her tight muscles. This was supported by training Tricia in a program of exercises to stretch the particularly tight tissues and to devlop better muscular (motor) control of her core trunk muscles, gluteals and foot muscles. While Tricia appeared to respond favorably, the long term prognosis remained a concern. She was therefore referrred for a podiattric consultation and assessment. Furthermore, given the large number of muscular and soft tissue issues, massage therapy was suggested to acclerate her progress in the short-term and to assist supporting Tricia in the long-term. 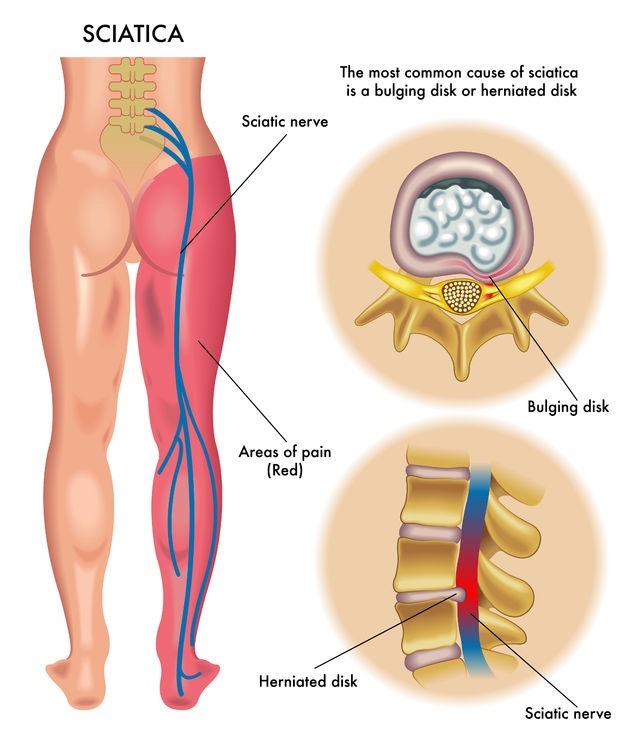 • History of lower back and leg pain starting 12 years ago following the birth of her second child. • Recent scans have showed degeneration of her left hip joint. • Basic gait assessment showed abnormal pronation (rolling in) and minor pelvic sway. • The pelvis is lower on left side (as was her left shoulder) as well as genu valgum (knock knees) more obvious on left leg. • Reduced hip range of motion (ROM) on left side compared to right as well as simliar tightness of the outer thigh (ITB) in left leg/thigh. • Stiffness in sub-talar joint of the ankle (STJ) and limited dorsiflexion(flexing upwards) of both ankles. is, where the ankle and heel are perfectly aligned). When in the neutral stance position, the alignment of the knees and hips improves greatly. good work done is undone as soon as she walked out the door. The excessive pronation is also overloading the muscles and ligaments in the arches of her feet, leading to a case of intermittent plantarfasciitis which causes her heel pain. Long term, strengthening exercises may help improve her function and lower limb posture, but improved, more supportive footwear, along with orthotics, will allow more even function across both legs and reduce the pelvis’ habit of overloading the left side. Further discussions with the Chiropractor may result in a small lift being placed under her left foot temporarily to improve the pelvic alignment. Tricia’s main focus at the moment is to return to exercise in order to lose some weight. Subsequently, the footwear recommendations at the moment will be sports shoes. Joggers which are designed to support the inside of her foot are recommended, with all brands now carrying shoes for different foot types and functions. We discussed different orthotic options with Tricia. Preformed orthotics are a good option, being cheaper and quick to fit, but I have recommended a custom-made version for her due to the difference in function and posture between her left and right foot/leg. Custom-made orthotics are fabricated following a 3D scan of her feet and multiple measurements to work out exactly what each foot needs. They are more expensive in the short term but allow both the Podiatrist and the Chiropractor to incorporate different features to suit Tricia’s individual needs. They can also be adjusted and modified over a 3-4 year period as her needs change and hopefully fitness levels improve. While Tricia was side-lying, I used an elbow to release the trigger points in the muscles on the outside of the hip. 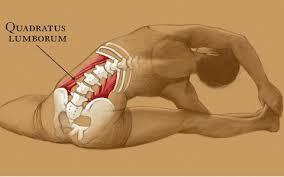 From here I spent a short time working the tension from the adductors to even out the pressure on the hip and leg. be most contributing to her discomfort, as well as a hip flexor stretch to help prevent the lower back from becoming so tight and sore. I also demonstrated a simple neck retraction exercise to help strengthen the deep neck flexors and reduce the frequency of upper back/shoulder tightness. Tricia reported a decrease in tightness and pain in her left lower back and hip and found movement less restricted after treatment. Phil is 42 years old, married and has two young children. He has for the past 18 years worked at a desk job in journalism namely in the sports department, which in general incorporates long, long hours at the desk, eating his meals at the desk etc. Phil also plays touch football at a good level, of which he does twice weekly, this includes no holding back when playing. Phil’s job is very stressful, with many deadlines. He complains of headaches, stiff neck and sore hips. He has visited his doctor who prescribed muscle relaxant tablets, which didn’t do much for him, just sent him to the toilet a lot. I initially explained that he needed to change his desk posture to a stand up desk, also, it was important to take breaks, even if it was just for lunch. I gave him a sheet of stand up stretches to do at this desk through the week. Phil was attending the clinic on a weekly basis, concentrating on his neck and shoulders firstly. Using the trigger point technique, we were able to show him what he could achieve with regular treatment by him and myself together. The headaches and stiffness improved significantly over the coming weeks and then we started to look at his hip pain/soreness. His gluts were not firing, so again using trigger therapy, it allowed me to give him relief, although it never seemed to go away. I introduced him to a foam roller and explained how to use it in the gluteal, (ITB) Illiotibial band, hip flexor and quad areas, all of which gave him great result, but again, it would return. After further conversation with Phil I found that during touch football he held nothing back and was “diving around like a teenage” his words. I referred him to a sports chiropractor who found that his hips were miss-aligned, further treatment with the chiropractor sorted out the hip problem and Phil now sees me on a regular basis for maintenance. He now stands at his desk and takes a regular lunch break. Jessica is a 28 year-old administration manager that presented with recurrent problems with her jaw. Jessica described how her jaw problems have arisen without an obvious cause though she is in no doubt feels it is related to her stress at work. Over the past three months, Jessica has suffered from daily tension in her jaw and face, headaches and a click on the right side of her jaw. When at worst, Jessica’s symptoms include a ‘full feeling’ in the ears, headaches at the back and the front of her head. he was fitter and has difficulty fitting exercise into her demanding life. Work starts at 6.30 each morning and she rarely get home before 6 pm. Living on her own, and now carrying her mortgage without a second income adds strain to her predicament. Jessica denied a long-standing history of this problem and the only related condition she could recall was a significant whiplash injury 15 months ago. When we examined Jessica, her posture showed that her head tilts to the right and she carries her head quite forward. While a facial scoliosis was absent, she is a Class II jaw occlusion with her lower jaw retracted. A degree of swelling was suspected below both eyes but no discolouration. Jessica’s upper back was also rounded, her muscles above the shoulder look overdeveloped and tense as does her muscles in front of her neck including the sternocleidomastiod muscle. When asked to open her jaw fully, Jessica’s mouth opening was limited to 34 mm (6 less than normal) with a slight deviation to the left. A small palpable (but almost inaudible) click was also noted on opening on the right side. Tight irritable bands (myofascial trigger points) were felt in the muscles on both sides of the jaw, temples, below the jaw and the base of the skull and the back of the neck. These muscles produced symptoms similar to those described by Jessica. It was also possible to palpate such muscular finding on the intraoral muscles. Jessica’s spinal movements were also compromised as she could not get her chin to reach her chest in normal posture and her ability to rotate her to the right and sidebend to the left was also limited. Furthermore, her upper back extension was quite reduced. On deeper palpation of her spine, a loss of normal motion between vertebra was noted at the base of the skull on the left, at C2/3 on the right and T3/4 on the right. We presented Jessica with a summary of our understanding of her condition and a plan of management. We considered that Jessica’s jaw symptoms were chiefly myofascial (muscular) sources of pain arising from faulty mechanics of her jaw and neck. The dysfunction of her upper neck (vertebral subluxation) could not be ruled out as part of her altered head and neck mechanics and suboptimal neurological control. We suspected that her neck component had lingered since her car accident. What also appears to be a key factor in Jessica’s condition is how her body reacts to the work pressures and emotional challenges she is experiencing. It is our experience and that of other clinicians is that people will increase the tension around their jaw in such emotional states and can ‘brux’ or clench their teeth beyond normal levels. 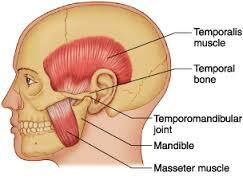 This has the effect of perpetuating and mechanical tension in the muscles of her jaw and the temporomandibular joints. Finally, Jessica’s headaches are in our opinion, a component of her overall problem and not separate. The headaches are consistent with the vertebral subluxation in her neck – both in terms of disturbed muscular function and altered neurological control. And, the headaches tie in with the excessive tension in the face. Chiropractic adjustments to Jessica’s neck and jaw are indicated in a case such as Jessica and we will work to understand which chiropractic adjustive technique provides the best relief and most comfort and well as confirming the technical aspects of our approach. Given the spread and layers of Jessica’s myofascial trigger points, she will benefit from muscular releases and sedation of the trigger points. To reinforce the effect, Jessica will be taught exercises to further relax the key muscles. There are facets of her case that suggest that Jessica may need a team approach to overcome her complaint. There is enough duration, frequency, spread of symptoms and extraneous factors that suggests her problem is somewhat complex. Jessica would probably benefit from utilising our in-house massage therapy. There are appears to be too many muscles and soft tissues involved to be address in a regular chiropractic treatment session. We suspect that a review by a dentist expert in temporomandibular disorders would be useful and can arrange an assessment with one of the experts we collaborate with. Finally, we are keeping our mind open to the notion that Jessica may need support from some counselling and training in meditation and relaxation by a psychologist. Sally is a 54 year-old woman who has been working as a hairdresser for over 20 years. She has a history of chronic neck pain and headaches, for which she takes Ibuprofe n (an anti-inflammatory) for pain relief and visits a massage therapist at the local shopping centre every couple of months. However, in the last three months, Sally has noticed transient dizziness to the point she feels nauseous and has to stop all activities completely. her head up after washing her hair. As symptoms got worse, Sally visited her local GP. The GP ordered blood tests and various scans to rule out any serious pathology. The GP also did a thorough ear examination to ensure there is no ear involvement causing the dizziness. All the pathology tests came back clear, apart from some wax in both ears. Sally was instructed to take Stemetil to give her relief from the dizziness and associated nausea. A week later, Sally finds that her dizziness is deteriorating and that she cannot move her head as the dizziness starts ‘straight away’. Sally made a trip to our practice thinking that there may be some involvement of her neck as it gets exacerbated with any head movement. Upon examination, it was found that Sally’s head was tilted slightly to the right and her shoulder height was higher on the left. She had an increased neck curve, rounded shoulders and a very flat upper back. Upon range of motion testing, Sally demonstrated limited movement to right neck rotation, tightness in flexion and a sharp pain as she extended her neck. Careful palpation revealed muscle spasm on left lower cervical spine and limited movement upon springing on the lower cervical facet joints. Endurance testing of the neck muscles revealed very poor ability to hold a sustained position, as was the quality of her neck movement pattern during the neck flexion test. Eye-tracking of Sally’s visual fields were all unremarkable, as was her deep tendon reflexes, sensory and motor testing of the upper limbs. A x-ray examination of the cervical spine was performed, and this revealed a slight loss of cervical curve and mild loss of C5/6 disc space. All these findings were discussed with Sally. 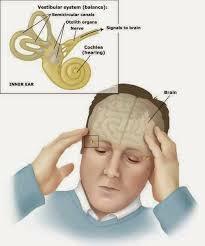 A diagnosis of cervicogenic vertigo was given and a treatment plan was discussed. Treatment was suggested and this was to involve gentle manipulation of the lower cervical facet joints, soft tissue massage and musculoskeletal dry needling in aim to improve mobility, break up muscle spasm and improve circulation around the neck and head. It is hoped that Sally will respond quite favourably. Initially we expect that the intensity, duration and frequency of her vertigo to be reduced. However, some remaining neck pain and stiffness could be envisaged which may addressed by her continuing with neck exercises to improve endurance of the spinal muscles. Her workstation both at home and at work will need to reviewed to ensure optimal work ergonomics. In addition, a report will be sent to Sally’s GP to communicate her progress. Cathy was referred by a local chiropractor. She had a curvature of the spine, which was causing her considerable pain. The chiropractor was hoping that regular treatment would help with her manipulations. Cathy was of slight build, but reasonably tall, approximately 5ft 7in. Works in an office 9-5, unfortunately, sitting under air conditioning, so gets lots of cold air directly at her body. She enjoys ultimate frizby and a good lunch. Her range of movement was limited in her lower back, but much worse in her neck. Lateral movement left to right was not good. Shoulders set high, showing tight traps/pecs. My aim with the chiropractor was to release tension in her lower back and shoulders, using palpation to find trigger points to release. Cathy was in prone position, slanting lower back identifying trigger points for release and then stretching, this is repeated several times. We then moved on to quadratus lumborum, which she felt was where most of the pain was, highlighting trigger points on both sides, repeating the same sequence. and also to move seats at work. Joseph is a forty-year-old firefighter who fell and hurt his right shoulder three years ago. Joseph hurt his shoulder when he fell hard while playing rugby league and was diagnosed with a sprain and partial dislocation of his right acromioclavicular joint at that time. The condition seemed to improve with time though never really healed and now Joseph is left with a shoulder that is hard to rely upon. His shoulder aches, makes cracking sounds and after he uses his shoulder a lot he finds that he can’t raise his arm fully. Over the past few months Joseph finds that his shoulder is deteriorating. 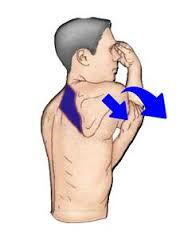 It aches more frequently, the pain is more intense and the shoulder feels weaker. Joseph’s sleep has become disturbed by his inability to sleep on that side for long periods. Therefore Joseph saw his GP who arranged an ultrasound of his shoulder and this showed that his rotator cuff is worn. Joseph typically exercises regularly but has cut back some time ago because of his shoulder. Having said all this, he does still manage to work okay but is worried how long his “shoulder will last”. Examination of Joseph’s posture showed that his right shoulder is unlevel compared to the left. It is lower and more forward. There appeared to be a loss of muscle bulk on the outer edge and the back of the shoulder. These changes are found in people with loss of specific muscle mass in key muscles. We watched Joseph move his right arm: he couldn’t quite raise it as far as he should and it moved like a ratchet; he couldn’t push his right hand very far up behind his back; when he crossed his right arm across his chest it elicited pain at the tip of his right shoulder and this could be increased if we applied slight overpressure to the arm. Further examination showed limited internal rotation and ability to fully lengthen the right pectoral muscles. Palpation of his shoulder revealed thickening of the ligaments and tissues on and around his right acromioclavicular joint with associated tenderness and the same type of situation but to lesser degree in his right sternoclavicular joint. The glenohumeral joint (the ball and socket’ one) could not fully translate to move into full abduction movement to get the arm up as high as possible. When we examined Joseph’s spine, his neck movements were stiff and limited to a degree in most directions. His upper back was even more restricted in extension and right rotation. Segmental examination revealed joint restriction and signs of vertebral subluxations at C6/7, T 2/3 and T4/5. Some imaging examinations, that Joseph brought with him, – X-rays and a recent ultrasound examination were reviewed. They showed a mild degree of degeneration at the right acromioclavicular joint and a partial thickness tear of the right supraspinatus tendon. There was also thickening of the right subscapularis tendon. We discussed the examination findings with Joseph and offered the following advice: We agreed that his shoulder complaint – though somewhat challenging was not something to be concerned about. We thought it unlikely that his deterioration would continue if we could help him find ways to overcome the symptoms. Given that he looks after himself so well, that his shoulder should respond to a combination of corrective exercises and chiropractic treatments. The insufficiency and implications of the scapular stabilisers and the rotator cuff muscles were explained to Joseph and that exercises would be taught to specifically address these imbalances. Having identified the cervicothoracic and right acromioclavicular joint dysfunction, it provides a platform that as chiropractors to work from. Having only a few muscle dysfunctions will make the task of exercising to improve Joseph’s shoulder easier. These are some of the reasons we would approach Joseph’s condition with confidence. Adding up-to date information and evidence on shoulder complaints will aid Joseph in his understanding and adherence for his recovery.